Aaron Gillen is again the king of the mountain in Santa Barbara’s Pier to Peak Half Marathon. 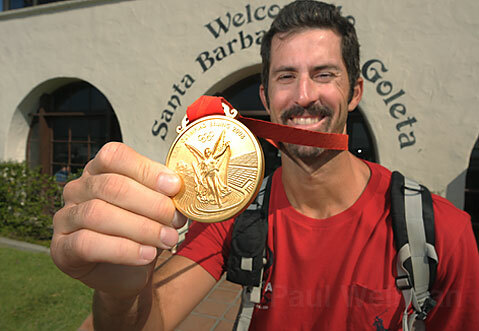 Gillen won the race from the foot of Stearns Wharf to the top of La Cumbre Peak by a country mile on Sunday, August 31. The 31-year-old distance runner, a favorite in every local race he enters, crossed the finish line in one hour, 33 minutes, and four seconds – a pace of 7:07 per mile. Runner-up John Lofthus was more than nine minutes behind in 1:42:15. Gillen, a teacher at El Puente High, also won the Pier to Peak race in 2004 and 2006. 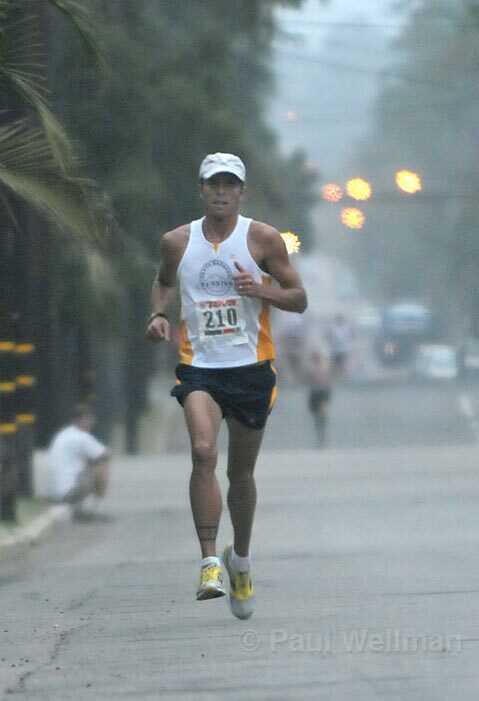 He did not beat his fastest time (1:32:33 in 2004), but Sunday’s performance was his best. Race organizers extended the course by four-tenths of a mile after discovering it fell short of the half-marathon distance (13.1 miles). Gillen’s time was relatively better than the old course record of 1:30:29 set by Jeff Jacobs in 2000. Sara Dillman was the first woman to finish in 1:47:20. She finished sixth overall out of 262 finishers. Andrea McCarty, the second female, was ninth overall in 1:49:10. The race is billed as “The World’s Toughest Half Marathon” because of the 4,000-foot climb. From mile five onward, the runners face an unrelenting uphill grade on Gibraltar Road and East Camino Cielo. When the AVP beach volleyball tour comes to Santa Barbara next weekend, Todd Rogers and Phil Dalhausser will be the team with the longest winning streak. The Olympic champions won the AVP Crocs Cup Shootout in Ohio on Sunday, defeating Sean Scott and Nick Lucena in the final by scores of 21-15, 21-19. Misty May-Treanor and Kerri Walsh saw their 112-match winning streak come to an end. They lost the women’s final to Elaine Youngs and Nicole Branagh, the last team to beat them more than a year ago. The two-time gold medalists did not surrender easily. The match lasted an hour and 45 minutes before Youngs/Branagh prevailed, 21-19, 10-21, 25-23. Rogers and Dalhausser now own an 11-match winning streak that started in Beijing. They will try to add to it at the AVP’s Santa Barbara tournament September 6-7 at West Beach.